Here’s a post-Thanksgiving addendum to that discussion of colonial dialects we had back in March. The Smithsonian and Plimouth Plantation gave some visitors the chance to eavesdrop on seventeenth-century New England. “Waking the Ancestors: Recovering the Lost Sacred Sounds of Colonial America,” was no ordinary living history program. Performed by educators from Plimoth Plantation in Plymouth, Massachusetts, the program was developed as part of the Smithsonian’s Religion in America initiative. Just as calls to prayer and church bells are part of city life around the world, the religious lives of America’s indigenous people and colonists had their own distinctive sounds. “Waking the Ancestors” explored just what those sounds might have been like. With the help of meticulous historical research, the team behind the program reconstructed how worship traditions sounded after the arrival of the Mayflower in 1620 in what is now Massachusetts. That soundscape is anything but familiar to 21st-century listeners. The region was new to English colonists, but not to the Wampanoag, who once numbered over 100,000 in what is now Massachusetts and Rhode Island. The Pilgrims would have heard the traditional songs and dances of Wampanoag people when they arrived—and in turn, the Wampanoag would have heard Pilgrims worshiping in Anglican, Puritan and Separatist styles. To demonstrate, the program featured worship music in all three styles, ranging from the choral harmonies of Anglicans to the unadorned chanting of Puritans and Separatists, which focused more on the text than music. “For [Separatists], music was just the handmaiden of worship,” Richard Pickering, Plimoth Plantation’s deputy director and the “Waking the Ancestors” program leader, tells Smithsonian.com. Attendees heard multiple versions of psalms sung in different styles and period accents—an attempt to illustrate the spiritual rifts and changes that occurred within what many think of as a homogenous group of colonists. Here’s the Twenty-Third Psalm as it sounded in New England four hundred years ago. It’s quite reminiscent of the Shakespearean pronunciation reconstructed by David Crystal, especially in the long “i”s and “a”s. But what about the dialect of the Pilgrims’ Wampanoag neighbors? In 1992, Jessie Little Doe Baird, who belongs to the Wampanoag Nation’s Mashpee tribe, began having dreams in which her ancestors appeared to her speaking a language she could not understand. Compelled to bring back Wôpanâak, which had been little used since the 1830s, Baird and researchers from the Massachusetts Institute of Technology used a rare book by missionary John Eliot to reconstruct the language. Eliot, who was given the nickname “the Apostle of the American Indian” due to his efforts to convert the area’s indigenous people, translated his so-called “Indian Bible,” a translation of the King James Bible, into the language of the local indigenous people in order to convert them, but his book has helped the Wampanoag connect even more deeply to their past traditions. I can see why it’s a sensitive issue. Still, I can’t help but wish somebody had recorded at least a snippet, so that those of us who weren’t in attendance could get a fuller sense of the colonial New England soundscape. I’ve been so busy reading history for school that I haven’t had time to…well, read other history books. Some interesting Rev War titles have hit the shelves this year, and I’m hoping to sink my teeth into a few of them over the holidays. Fatal Sunday: George Washington, the Monmouth Campaign, and the Politics of Battle by Mark Edward Lender and Garry Wheeler Stone. Looks like this is partly a battle study and partly an examination of the politics of command. That’s a good approach for a book on Monmouth, an engagement that was already the subject of bitter dispute before the shooting stopped. Revolution on the Hudson: New York City and the Hudson River Valley in the American War of Independence by George C. Daughan. British strategists tried repeatedly to secure control of the Hudson and sever New England from the rest of the colonies. Vaughan argues that the whole idea was doomed to fail from the start. The Struggle for Sea Power: A Naval History of the American Revolution by Sam Willis. A new overview of an aspect of the war that doesn’t get as much attention as it should. Grand Forage 1778: The Battleground Around New York City by Todd W. Braisted. Braisted is the proprietor of the Online Institute for Advanced Loyalist Studies, a fantastic electronic resource. The Road to Concord: How Four Stolen Cannon Ignited the Revolutionary War by J.L. Bell. The historian behind the always engaging Boston 1775 blog on the events that set off the War of Independence. Journal of the American Revolution: Annual Volume 2016 edited by Todd Andrlik. Greatest hits from one of my favorite online resources. Washington’s Immortals: The Untold Story of an Elite Regiment Who Changed the Course of the Revolution by Patrick K. O’Donnell. It’s great to see a book-length study of the crack Maryland Continentals. The Swamp Fox: How Francis Marion Saved the American Revolution by John Oller. Separating the man from the myth has always been tricky when it comes to Marion. As a Southern Theater guy, I’m really looking forward to reading this one. 1777: Tipping Point at Saratoga by Dean Snow. Snow is a trained archaeologist who has done work at Saratoga. Should be some new tidbits here. Whenever I’m down in the McClung Museum’s basement, I stop to pay my respects to an old friend. Old, that is, in a relative sense. 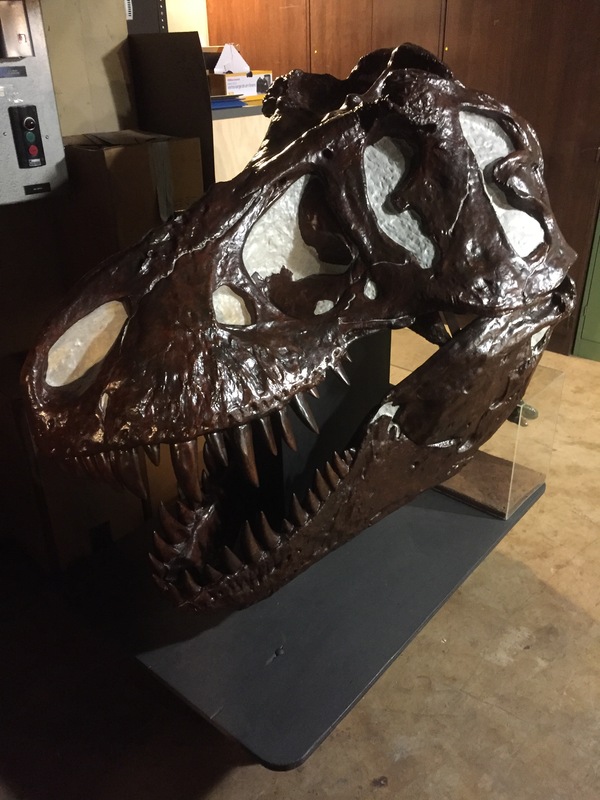 This is a cast facsimile of a T. rex skull rather than the real thing. But this bad boy (girl?) and I go back a long way. My dad used to indulge my dino obsession by taking me to the McClung Museum on weekends so I could hang out in the old geology and fossil exhibit, where the T. rex skull went on display sometime back in the early or mid-nineties. That exhibit has now gone the way of the specimens it once showcased. The McClung’s current geology and fossil gallery opened in 2002 with some new dino skull casts and gorgeous dioramas, but sans tyrant lizard king. 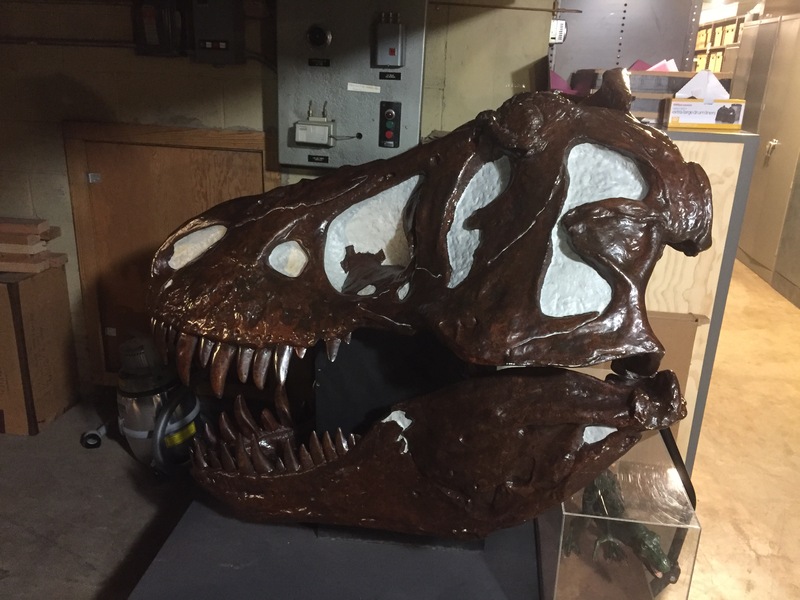 Now the T. rex is enjoying semi-retirement downstairs, although we wheel him out for school tours from time to time. …right in front of the skeleton it was once attached to. Fossil T. rex skulls are so heavy that it’s hard to mount them at standing height, so most museum specimens have lighter copies stuck on the ends of their necks. One other thing to take note of when you’re looking head-on at a T. rex is the position of the eye sockets. Although they’re on the sides of the head, they’re oriented so that the eyes themselves would have faced forward, which probably meant good depth perception. In fact, research by Kent Stevens indicates that T. rex had superb vision. Combine an eagle’s eyesight, an exceptional sense of smell, and a bone-crushing bite, wrap it all up in a forty-foot package, and you’ve got one of the most remarkable carnivores in the history of life on this planet. In other words, it’s probably not a good idea to stand still and hope he doesn’t notice you. Anyway, as awesome as this guy looked in the old exhibit, I’m sort of glad he’s taken up quarters behind the scenes. As a kid, I used to stand in front of his display case and wonder what it would feel like to run my hands across those bony protrusions and along those fearsome jaws. Now I don’t have to wonder, and it’s one of many reasons I love my job. The past century has taken a toll on the majestic creature. The lion’s tawny fur is crushed in places, and his rumpled mane gives him the appearance of having bed head. A portion of his ear is clipped, chunks of fur are missing, and his glass eyes have gone foggy with age. Conservator Ron Harvey surveyed the mount, assessing the damage, deciding what to repair and what to leave as is. The job of a natural history conservator goes far beyond simple aesthetics. Harvey must maintain the specimen’s scientific usefulness, ensuring that it can be studied by future generations. He also wants to preserve it as a historical artifact — an object that can tell us about our past and its own. When museum visitors look at this mount in six months, Harvey hopes they’ll get a sense of how it got to the museum, what it meant when they arrived, what it stills mean today. After consulting with museum conservation specialist Cathy Hawks, he decided to leave the lion’s glass eyes — which are cloudy and crizzled from a phenomenon called glass disease — as they are. They’re historic artifacts too, after all, and they’re suggestive of the lion’s old age and impressive backstory. On top of which, it would probably cause more damage to try to take them out. “What we’re trying to do in conservation is preserve and extend the life of . . . this body that has not been sapped of all its knowledge,” Harvey said. He noted that the specimen has been cited in scientific journal articles as recently as 2010, and that scientists are developing new tools for research all the time. There may be other stories — about lion biology, East African ecosystems, 20th century taxidermy methods — buried inside this specimen, waiting for someone with the right question and the right tools to answer it. Roosevelt’s lion is a working scientific research specimen, but it’s also a historic artifact. It reminds us that science is a human process embedded in the time and culture in which it takes place. The National Museum of Natural History, the American Museum of Natural History in New York, the Peabody Museum at Yale, and the Natural History Museum don’t just preserve the record of life on earth, but also the record of how we’ve come to understand it. That’s one of the things that makes a visit to venerable old natural history museums so special. As I’ve said before, a stroll through the fossil galleries of the American Museum of Natural History is almost like a tour of milestones in the history of vertebrate paleontology in the late nineteenth and twentieth centuries. Seeing any real dinosaur fossil is a treat, but at the AMNH you’re also seeing the life’s work of legendary figures like Barnum Brown, Henry F. Osborn, Charles H. Sternberg, and Roy Chapman Andrews. You’re standing in the presence of giants in a dual sense, both the remains of long-dead creatures and the ghosts of those who brought them to light. If you’re planning a trip to the AMNH, I heartily recommend reading Douglas Preston’s Dinosaurs in the Attic: An Excursion into the American Museum of Natural History before your visit. It’s an engrossing reminder that natural history and human history are intertwined, and that museums house stories as well as specimens. Thousands of stories, millions of stories—stories behind every pair of glass eyes, mounted on every metal armature, locked away in every drawer.